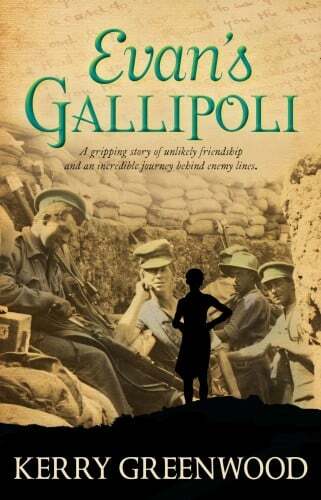 A gripping novel about an incredible journey behind enemy lines, told in diary form. 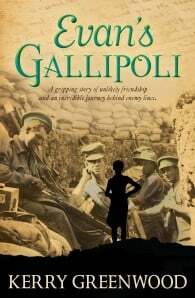 Fourteen-year-old Evan Warrender travels with his father to the Dardenelles, where they intend to provide succour to the Allied soldiers. When they are captured by the Turks, they are launched into an epic journey, living on their wits and the kindness of strangers as they escape and travel through Turkey, back to Greece and finally home to Australia. Along the way they meet unlikely friends and companions, some of whom have deep secrets. And when Evan’s own secret is revealed, we realise just how incredible the journey has truly been. Evan’s fascinating survival story takes readers beyond the frontline and creates an all-encompassing account of this significant time in our military history. Impeccably researched, this is an eye-opening adventure story that cleverly explores both sides of the war. Kerry Greenwood is the author of more than forty novels, six non-fiction works and the editor of two collections. Previous novels in the Phryne Fisher series are Cocaine Blues, Flying too High, Murder on the Ballarat Train, Death on the Victoria Dock, Blood and Circuses, The Green Mill Murder, Ruddy Gore, Urn Burial, Raisins and Almonds, Death Before Wicket, Away with the Fairies, Murder in Montparnasse, The Castlemaine Murders, Queen of the Flowers, Death by Water, Murder in the Dark, A Question of Death: An illustrated Phryne Fisher Treasury, Murder on a Midsummer Night and most recently, Dead Man's Chest. She is also the author of the Corinna Chapman crime series, Earthly Delights, Heavenly Pleasures, Devil's Food, Trick or Treat, Forbidden Fruit and Cooking the Books. When she is not writing she is an advocate in Magistrates' Court for the Legal Aid Commission. She is not married, has no children and lives with a registered Wizard.